Build review Pt II: "Bicentennial Phantoms"
The Phantom is now just about ready for painting. The pylons, front landing gear and wheels will be painted separately. As you can see, some areas have already received a light coat of Tamiya white primer to check seam lines. On the underside, I’ve masked up a strip where the wing pylons will be attached. I always prefer gluing to bare plastic rather than over paint. The main wheel wells were airbrushed with Tamiya white primer. Test fit of the stabilisers. They attached firmly with no glue required. The opened ends of the exhausts are masked off. A final look at the cockpit and intakes before being masked up. The canopy framing does look a bit rough here; I normally repaint this area after the main painting anyway. Another nice feature of the Eduard edition of this kit, is the addition of their Brassin’ Martin Baker Mk.7 ejection seats. These seats are like a little kit in themselves. The main seat (RP1) and the head rest / parachute pack (RP2) are provided as separate resin parts. I started off giving them a coat of flat black. The head rest sits in behind the lumbar pad. Here I am dry fitting after the basic painting has been finished. The seat pad is Model Master Green Drab (FS34086), lumbar pad is Humbrol Matt Khaki (26), lower area of the head rest Olive Drab and the top area is Model Master RAF Dark Slate Grey (2056). I later would discover that the head rest wasn’t sitting low enough behind the lumbar pad of the seat. Comparing the Eduard CAD images of their seats with what I had, the gap between the lumbar pad and the head rest was obviously smaller. Fortunately it wouldn’t be very noticeable after all the belts were fitted, but just be mindful when putting these seats together. One mistake I found, this pull handle (PE49) is meant to be on the right hand side of the seat which is correctly shown in the instructions. However, Eduard made a mistake and put the cut-out in the seat pad on the left. Looking at the previous pic of the Eduard CAD image, the handle is on the correct side. So not sure what happened here. Fortunately this handle is easily hidden by the seat’s harness so you won’t notice it not being there. All the photo-etch parts are attached and additional detail provided by lead wire per the instructions. The seat is dry-brushed with a light grey and a little aluminium. The seat was then given a gloss coat (Future) before applying an oil wash of burnt umber. Everything would get a coat of Model Master Flat Coat Lacquer. 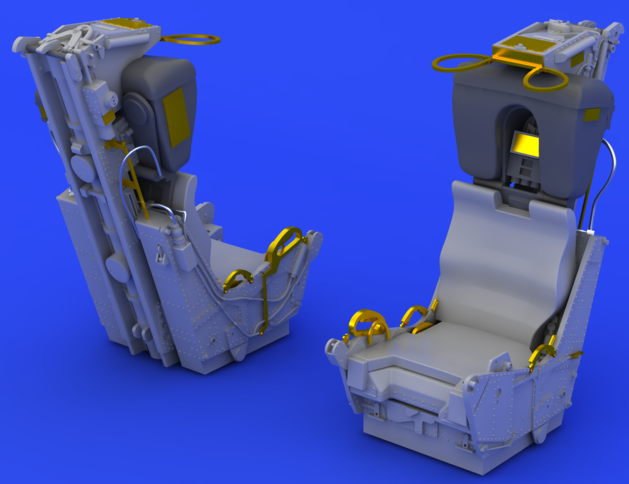 The ejection seat pull handles are pre-painted photo-etch, folded over. The pre-painted seat harness is a fabric type made by HGW for Eduard. Buckles are photo-etched. The belts peel off their backing paper, but it should be noted these are not self-adhesive. Following the instructions, each belt loops through a photo-etch buckle and needs to be super glued to itself. 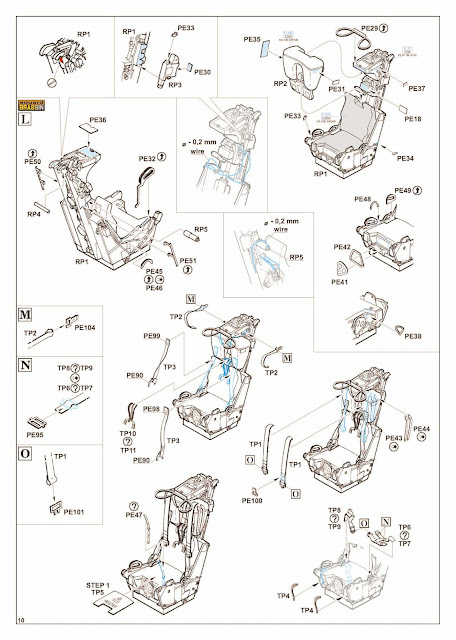 They can be a little tricky, but I continued to go about assembling all the individual belt parts prior to attaching them to the seats. The finished seats turn out to be very convincing and well worth the effort. 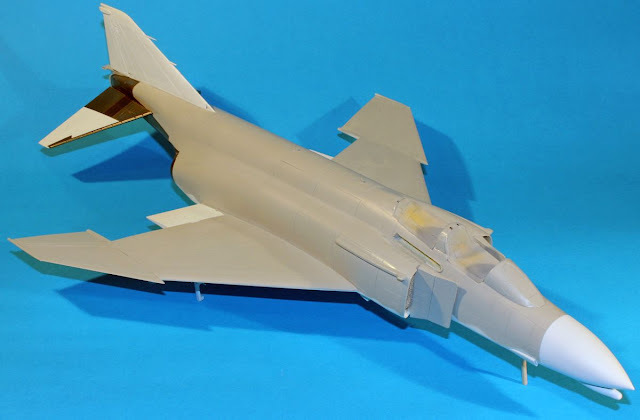 I can’t wait to see what they look like in the finished Phantom. 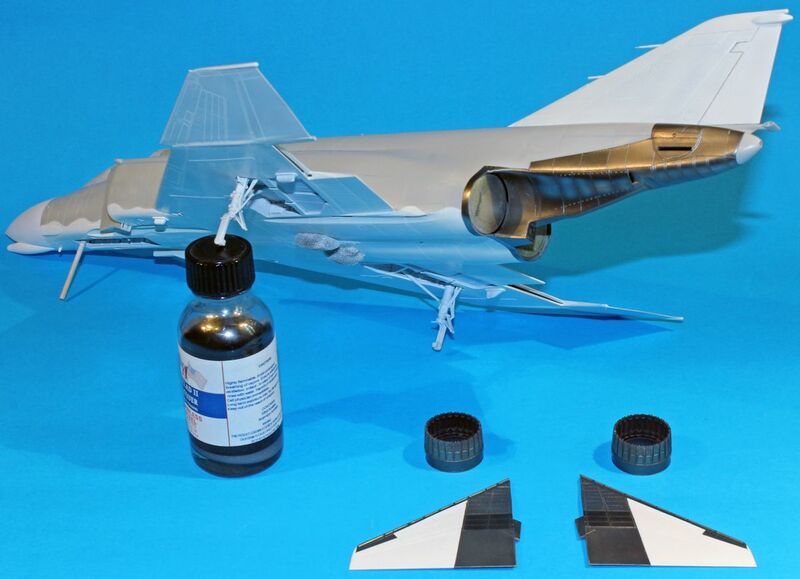 First up is to paint the anti-collision light on the tail with a coat of clear red, then mask it up. The intakes are ‘masked up’ with the use of some packaging foam which neatly conforms to the intake shape. You can see the strip of masking tape on the outside of the intake I applied earlier. With the tape and the foam together, there is little chance of overspray getting down the intakes. The whole underside of the aircraft was airbrushed in Insignia White FS17875 (Mr. Color 316) and for a contrast the nose cone and wheel wells were done in Tamiya White Primer. Once dried, the tail, moving surfaces and nose were masked up. The soft demarcation line between the white underside and gull grey upper surfaces was achieved using blu-tac. Note: the tail itself should be gull grey with a white rudder. However the scheme I was doing features red and white strips, so a consisted white undercoat would be wise here. The upper surfaces were airbrushed Gull Grey FS16440 (Mr. Color 315). Things were starting to look good after removing the masking. A lighter coat of the same colour was airbrushed on the centres of individual panels for a faded effect (a little hard to tell in these pics after starting with a light colour anyway). Next was to mask up the aft fuselage area for the bare metal finish. First up, is a coat of Tamiya semi-gloss black. Then it’s time to go to town with the ALCLAD2 paints. As previously mentioned when doing the engine exhausts, this area of the Phantom can vary wildly between aircraft. The titanium areas most directly in the path of the hot exhaust take on a very weathered and sooty appearance. Lighter shades were used on the upper side plates. Removing the masking tape reveals the results. The black anti-glare panel in front of the pilot’s canopy is airbrushed, along with the rubber end of the AN/ALQ-126 waveguide fairings along the top of both air intakes. The pitot tubes on the tail are painted in Insignia Red FS11136 (Mr. Color 327) and Insignia Blue FS15050 (Mr. Color 328) which matched the decal colour perfectly. Finally a couple of light coats of gloss clear (Future) was airbrushed in preparation for decaling. As previously mentioned, I decided on the Bicentennial scheme from VF-151 Vigilantes. The patriotic red, white and blue tail is provided as a single decal for either side. 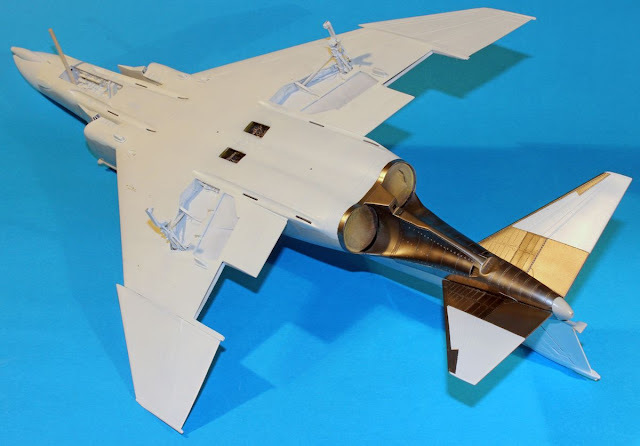 First thoughts were about whether this would fit completely over the Phantom’s large tail with no gaps? So before applying any other decal, these needed to go down first. If there were to be a problem at least I would have a chance to change my decal options. For such a large decal that had to fit completely and precisely over an area, Furball did a great job with the sizing. Not only did the decal have to reach from the leading edge of the tail to the trailing edge of the rudder, it also had to align with the anti-collision light. I probably would have preferred a separate decal for the rudder’s modex number 01 as it gets quite close to the edge. The decals also responded well to Micro Set and Micro Sol. There were a few gaps and tears in the tail decal while trying to work it down into the detail. Fortunately the decal sheet had some matching red and blue from other markings which I was able to use for patch repairing. The decals are so thin, this was barely noticeable. Jumping ahead, most of the major squadron markings and national insignia have been applied. The decals on the tips of the outer wing had a similar gap problem to the tail and had to be patched with decal offcuts. Decals applied to the canopies. Now the fun bit. The Phantom is notorious for its amount of factory stencilling, and Eduard and Furball Aero-Design gives you everything. The decal instructions are labelled ‘Access Door Markings’ and “Instructional Markings’. I printed a copy of the PDF (available from Eduard website) of the decaling instruction on A3 paper and marked them off as I went. And how fine are these decals? Well you can actually read the finest and smallest printing. Are you going to apply all these decals? Well no. From all the pictures I’ve seen of Phantoms, all these factory stencils rarely get maintained in the field except for the instructional markings such as NO STEP, NO PUSH, Warnings and Cautions etc. How far you go is a personal taste. With the decals dried, the model received another coat of gloss clear (Future) in preparation of weathering and a panel line wash. The final part of this article can be seen here on TMN in a day or two – stay tuned! Part I of the build is here.. Thanks to Eduard for sending this kit to build - it is available directly from Eduard or their Distributors worldwide.